DEPRAG SCHULZ & CO. GMBH, the air motor specialists are widening the gap between themselves and their nearest competitors. The combination of innovative ideas and expertise bred from decades of experience result in the production and development of top quality devices. Three new high power 900 W and 1.2 kW motor models have been added to the machine manufacturer's range of products. They have expanded their great value BASIC LINE series, air motors with cast iron housing, and now have two more performance classes with 900 W and 1.2 kW and the ADVANCED LINE stainless steel motor series now has a 900 W class. The guiding principle of DEPRAG engineers is to use successful, tried and tested methods whilst also furthering new technological advances. The company fulfils the current requirements for modern drive technology with their development and construction of outstanding state-of-the-art air motors. Consequently DEPRAG air motors are the authoritative choice for inexpensive, long-life, safe drive solutions for standard and environmentally critical applications. Air vane motors offer an interesting alternative for drive and control tasks in various sectors of industry. The principle of air motors is a simple one; compressed air causes the rotor to turn inside an eccentric cylinder. There are vanes ,guided by slots in the rotor, which are pushed outwards against the cylinder wall by centrifugal force. Working chambers are formed for the compressed air. Expansion of the compressed air transforms the pressure energy into kinetic energy and rotational movement is generated. The BASIC LINE air vane motors, series 63 by the German specialists have a low-cost drive which has proven its worth in standard application environments. These motors have cast iron housings and a patented vane exchange system. The routine exchange of vanes can be carried out with just a few movements. After loosening the cylinder screw and removing the roll the old vanes can be extracted and new ones replaced using tweezers. There is no need to disassemble the motor; vane exchange can be carried out directly on the device. This is a massive benefit in reducing maintenance time, which in turn saves on production time. The BASIC LINE air vane motors used to only be available in performance classes 200 W, 400 W and 600 W. Now 900 W motors and even drives with 1.2 kW have been added to the standard programme. The motors are ATEX certified, robust and reliable. 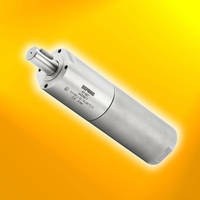 They have a broad range of speeds and are available with LH/RH rotation (reversible). "Our superb value for money machines are now available in the high powered 900 W and 1.2 kW versions", explains Product Manager Dagmar Hierl. "We now cover the whole range of market requirements". Also newly launched onto the market are the 900 W air motors of the ADVANCED LINE range made from top quality stainless steel. The ADVANCED LINE motors are ideal drives for "critical" environments. The completely sealed, non-corrosive drives impose their power on dusty bulk goods systems and can withstand acids when used in chemical agitators. They are insensitive both to steam when sterilised for the medical industry and to cleaning solvents in the food industry. The motors maintain power whilst submerged and in a cleanroom they can be operated oil-free with only a slight loss of power. The ADVANCED LINE drives are equipped with extremely resilient motor spindles and have a particularly long-life radial shaft sealant ring. The ADVANCED LINE offers a wide variety of motors types, from 20 to 1200 W, from small speeds up to the fastest of motors. It is easy to find the best power source for your application. The modular principle allows for an excellent price/performance ratio. The standard programme offers various gearboxes for speed and torque optimisation and a diverse selection of output spindles, as well as a choice of mounting adapters. The new range of 900 W air motors bridges the gap between the 600 W and the 1.2 kW drive classes. It has now become even simpler to find the right drive for your specific application. These new machines optimise purchase price and operational costs. The more the drive is designed to fit the application, the more efficiently it can work. Ideally air motors should be operated at nominal speed and at the torque specifically required for the application. If the drive is oversized then the purchase price for the air motor will be disproportionately high. If the air motor is operated far outside the optimum working range e.g. close to idle speed, the less economical it is with regard to air consumption and service life. The air motors of the BASIC LINE and ADVANCED LINE carry the ATEX seal of approval and are therefore authorised for use in potentially explosive environments. Air is a particularly good drive solution for hazardous applications because it introduces no electrical services and the decompression of the motor's exhaust air cools down any frictional heat generated. Consequently the motor runs cool when under load and the possibility of overheating or ignition of combustible materials or gases is eliminated. DEPRAG SCHULZ GMBH & CO. has around 600 employees and is represented in over 50 countries. One of the core areas of expertise of the machine and systems manufacturers from Amberg, Germany is the field of air motors. With their latest product expansion they have strengthened their hold on the air motor market. Decades of experience enable the DEPRAG engineers to provide valuable support for their clients in the customisation of motors to fit the required application.